The map is designed to show Earth's most prominent features when viewed from a distance, and more detailed features upon closer inspection. The back of the map zooms in to highligh examples of fundamental processes, while providing text, timelines, references, and other resources to enhance understanding of this dynamic planet. Compiled by Tom Simkin (Smithsonian Institution), Robert I. Tilling (USGS), Peter R. Vogt (U.S. Naval Research Laboratory), Stephen H. Kirby (USGS), Paul Kimberly (Smithsonian Institution), and David B. Stewart (USGS). More info at the This Dynamic Planet page. Most new crust forms at ocean ridge crests, is carried slowly away by plate movement, and is ultimately recycled deep into the earth, causing earthquakes and volcanism along the boundaries between moving tectonic plates. Oceans are continually opening (e.g., Red Sea, Atlantic) or closing (e.g., Mediterranean). Because continental crust is thicker and less dense than thinner, younger oceanic crust, most does not sink deep enough to be recycled, and remains largely preserved on land. Consequently, most continental bedrock is far older than the oldest oceanic bedrock (see back of map). The earthquakes and volcanoes that mark plate boundaries are clearly shown on this map, as are craters made by impacts of extraterrestrial objects that punctuate Earth's history, some causing catastrophic ecological changes. Over geologic time, continuing plate movements, together with relentless erosion and redeposition of material, mask or obliterate traces of earlier plate-tectonic or impact processes, making the older chapters of Earth's 4,500-million-year history increasingly difficult to read. The recent activity shown on this map provides only a present-day snapshot of Earth's long history, helping to illustrate how its present surface came to be. Both the front and back of this map illustrate the enormous recent growth in our knowledge of planet Earth. Yet, much remains unknown, particularly about the processes operating below the ever-shifting plates and the detailed geological history during all but the most recent stage of Earth's development. The two-sided map sells for $9.00 per copy and can be ordered from the USGS Store Map Locator page, enter "This Dynamic Planet" into the Product Name box. For sale by U.S. Geological Survey, Information Services, Box 25286, Federal Center, Denver, CO 80225; telephone 1-888-ASK-USGS; product number 206335. 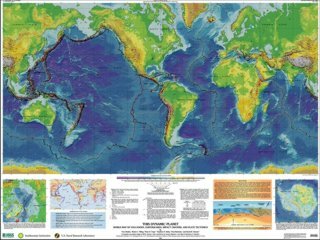 Simkin, T., Tilling, R.I., Vogt, P.R., Kirby, S.H., Kimberly, P., and Stewart, D.B., 2006, This dynamic planet: World map of volcanoes, earthquakes, impact craters, and plate tectonics: U.S. Geological Survey Geologic Investigations Series Map I-2800, 1 two-sided sheet, scale 1:30,000,000.